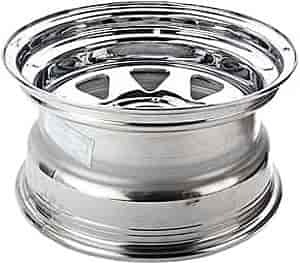 JEGS 67027 - Sport Lite 8-Hole Wheel Diameter & Width: 15 x 8 "
Cragar Nomad II Wheel Size: 15" x 8"
Cragar Nomad II wheels have a brilliant chrome finish and feature an all-steel construction with eight spokes. Cragar Nomad II wheels are available in many sizes and bolt patterns allowing them to fit a wide variety of applications. Jegs also carries Nomad I Wheels in a white finish. Wheel and Tire packages are available with all of our wheels. Call your Jegs Tech to inquire about adding tires today.